The head of Iraq's Sunni parliamentary bloc has been assassinated at a mosque in the capital, in an attack that has killed at least four other people. Harith al-Obaidi, a human-rights advocate, was shot as he left a mosque in the Yarmouk area of western Baghdad. Iraqi police said a teenager carried out the attack. He was shot dead by a guard as he tried to escape. Prime Minister Nouri Maliki has said violence is likely to increase before Iraq's general election next year. Mr Obaidi was the leader of Iraq's Accordance Front. A university professor with a doctorate in Islam, he had just finished delivering the sermon at Friday prayers. Iraqi police said the youth opened fire as worshippers began to leave the mosque, killing Mr Obaidi and one of his body guards. He then threw a hand grenade to cover his escape, causing further casualties. 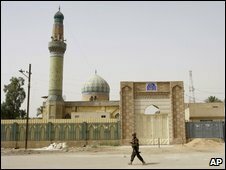 The BBC's Jim Muir in Baghdad says the assumption will be that this attack was carried out by insurgents from Mr Obeidi's own Sunni community, who have often targeted Sunnis involved with the government.